I often hear people use the excuse,” I had no choice.” I dispise hearing that. Such an excuse. We always have a choice. We might not like the choices we have or we may have put ourselves in a position where the choices are limited, but we do have a choice. Life is all about the choices you make. Everything we do is a choice. You choose to go to school, or not. You choose to work hard or not. You choose what you eat, or not eat. You choose how you think, and what you think about. You choose what to watch, listen to, what to read. You choose what you do with your time. You might not have had the choice of how you grew up but you do have the choice as to how you want to live. We all come from different circumstances, but that does not determine your future. 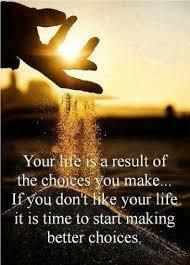 What determines your future are the choices you make! Sometimes we make the wrong choices. We have to be accountable for that bad choices and move on. Today, no one wants to be held accountable for their choices. It’s always someone else’s fault. That gets you nowhere fast. Take responsibility for your choices and actions and don’t play the blame game. There are so many examples of young people that come from affluent families and are given everything to succeed in life, and yet they end up a broken mess. Then, you have those whom have come from absolutely nothing and made the right choices to go on and have extraordinary lives! It is never too late to change your path and make better choices. Now is a good time to change. Decide now what you want, and what you need to do to get there. If you need to change the way you eat, then make the choice to shop better. If you need to exercise, make the choice now to get up and move. It doesn’t have to be the perfect situation, just do it! If you need more knowledge to increase your income or change your economic status then make the choice to research what you need to move ahead, and educate yourself. It is just that simple. We make things more complicated than they have to be. Just make the choice to change.